Basement Waterproofing & Foundation Repair. Having a leaking and wet basement or cracking foundation? Call us today and our waterproofing specialists will put an end to your water leaks and we’ll help to prevent your home from more serious moisture related problems such as mold, decay, and even structural problems. Your moisture or water issues in your basement can be caused by cracks in your home’s foundation, blocked weeping tile system or lack of proper protection around the foundation. 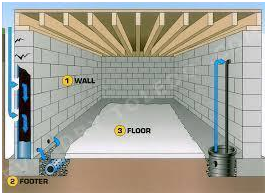 Exterior Basement Waterproofing will protect the house foundation from water deterioration. 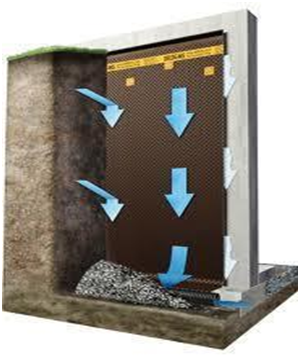 The Exterior Basement Waterproofing method requires excavation along exterior foundation walls. The walls will be cleaned and inspected for any existing structural cracks. All cracks will be repaired and the walls will be sealed with a sheet of drainage membrane. A newly installed weeping tile pipe covered by a layer of gravel will maximize the drainage. The excavated area will be backfilled with the soil to its original level. Our professional waterproofing services will guarantee that there will be no future issues with water seepage and drainage. 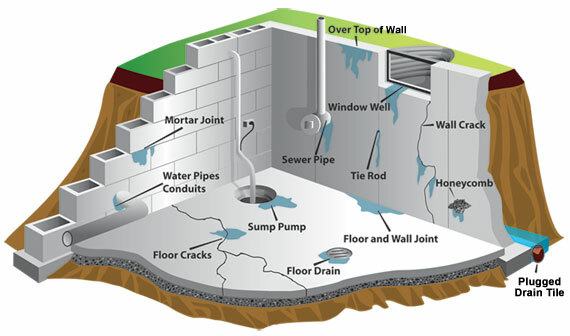 Interior Basement Waterproofing method requires exposure of the basement walls and the excavation of a trench along your foundation wall for a new weeping tile pipe to be installed and connected to a sump pump or a floor drain. The walls are then covered by a sheet of drainage membrane and gravel laid over the weeping tile pipe will direct water to a new filtered weeping tile pipe. New concrete installed over the opened trench will restore your basement floors to its initial state.